Many Florida communities are currently devastated by Hurricane Irma, and rescue crews are needed for support and cleanup. 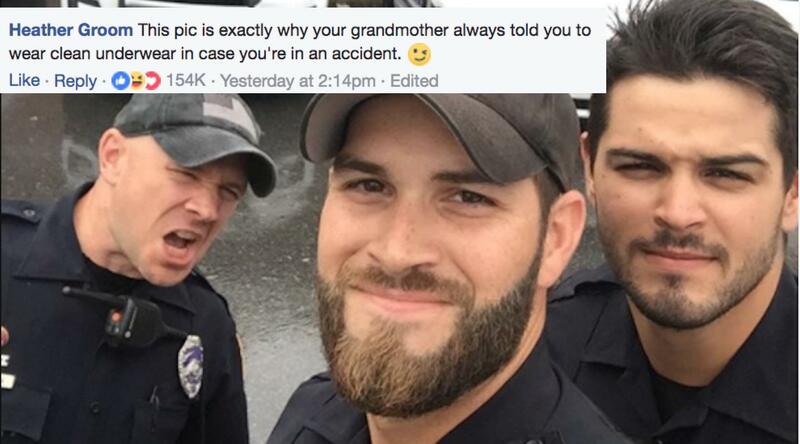 The Gainesville Police Department is on the job, and they too are taking selfies as they get their shift started. One photo of a small night crew getting ready to work has taken the Internet by storm. Originally, the post read, "Officers Nordman, Hamill and Rengering...part of the night crew getting ready to do some work. #Irma." The best part of all this may be how tickled the Gainesville Police are about it. They updated with some new info, including who is still single. They're also planning a calendar, with proceeds to go to Irma recovery. Shut up and take my money! 1. We are dying with the comments. You've actually made our chief blush with some of them. 5. Please do not call 9-1-1 and request this group respond to your "incident"
Thank you all for the hilarious comments...they have brightened our time up here. As for the calendar, we are going to try and do something fairly quickly and funds raised will go to Hurricane Irma recovery here in Florida.